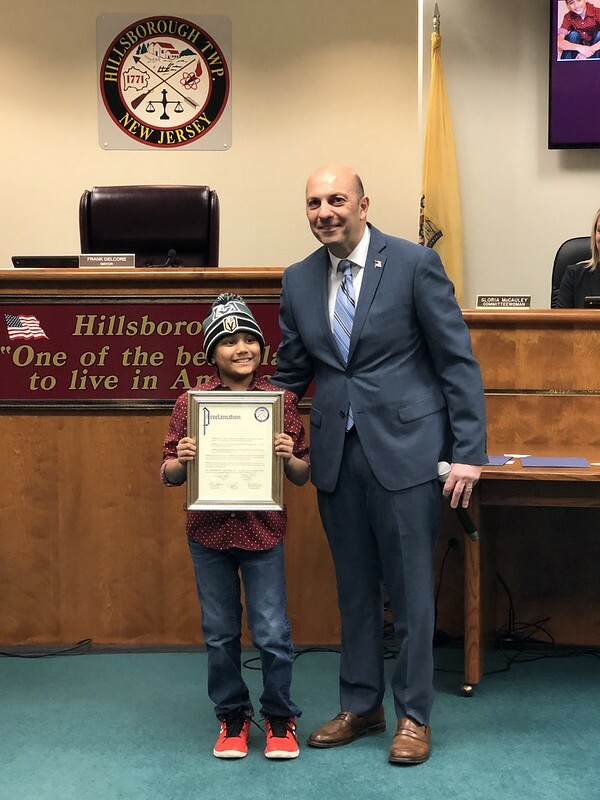 At the March 26th Township Committee Meeting, the Mayor and Township Committee commended Arjun Jain for his courage, bravery, compassion, and spirit. Arjun, a local student and hockey player, was diagnosed with leukemia on August 19, 2018, taking him away from school and the sport he loves. While Arjun Jain began his courageous fight he also began a blog, “I am Arjun Jain” chronicling his journey. Through his daily blog Arjun has shown an incredible spirit, display of courage and maturity beyond his years. Arjun, through his actions and affiliation as an honorary member of the Hillsborough High School Ice Hockey Team, has brought awareness about leukemia to the public, has demonstrated great resiliency during this time of adversity, and serves as a role model to others. In the midst of his battle with cancer Arjun continually expresses an interest in his blog to help others and wishes to make a difference, in his own words, “by showing them that staying positive can help you survive all the tough times”.